Getting my inner Hungarian on! Every so often, you have to return to your roots. We were talking about our daughter-in-law, Diana’s birthday bash at our house and we were wondering what to serve. We remembered that Diana had enjoyed the Chicken Paprikash we had at the Hungarian Fest a year ago and so I decided to get my inner Hungarian on. This morning, after a most wonderful previous evening of having friends over for dinner and then to play Monopoly (which we haven’t played in years), it was a bit tough in the morning getting to the point of deciding to chop onions, but I did go there. Eating chez les Koerner is one in which we all participate. Michael made the nukedly (Hungarian Spätzle) and Christian is bringing the appetizers: Buffalo wings and salad. So I made three chickens’ worth of chicken, sautéed the onions, lightly browned the poultry, and then steamed it for a little over an hour. 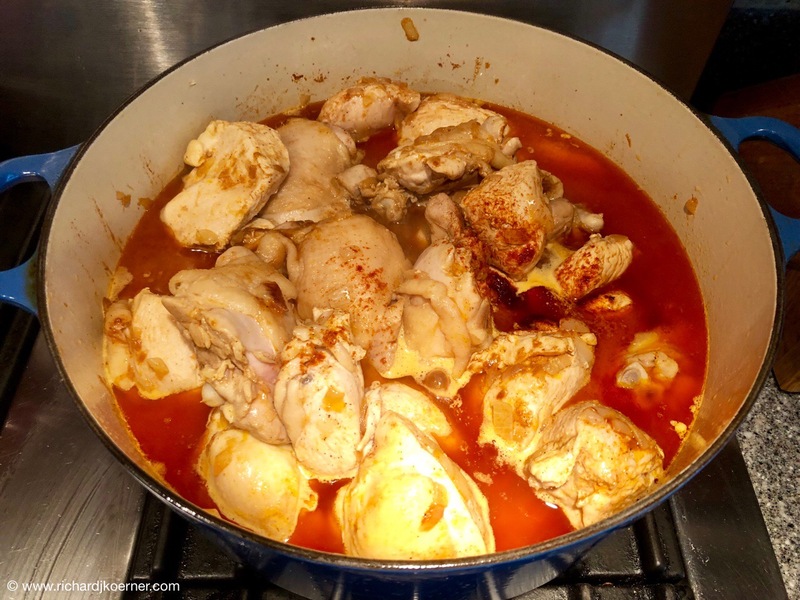 I separated the chicken from the broth and later I will mix in sour cream to the broth gotten from the cooking, a beautiful orange gravy, flavored by a tomato or two, salt, pepper, and the most important ingredient, Szeged Paprika. I will keep some chicken and broth separate from the sour cream. I am guessing that the kids will not be fond of the sour cream sauce (my Grandmother always did this for me when I was a kid) and besides; we have a lactose intolerant person as well. Even without the sour cream, it is delicious. Mary Kay made an angel food cake from scratch yesterday, a ‘kill two birds with one stone,’ kind of deal. We had parfaits with it yesterday and mixed berries. Today it will morph into one of Diana’s favorite desserts: strawberry shortcake. Once again, the Koerners are eating like kings. This entry was posted in Cuisine and Food, Culture, Hungarian, Life in general, Thoughts and philosophy, Uncategorized. Bookmark the permalink.